The Access Board develops accessibility guidelines which are the minimum technical provisions for access. 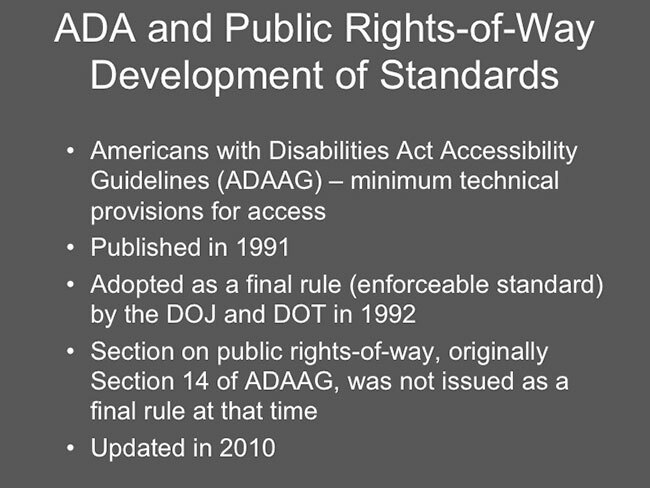 The Americans with Disabilities Act Accessibility Guidelines, often referred to as ADAAG, were first published in 1991. Those guidelines were adopted as a final rule (enforceable standard) by the Department of Justice and Department of Transportation in 1992. However, the section on public rights-of-way, originally Section 14 of ADAAG, was not adopted as a final rule at that time. The standards adopted were basically standards for buildings and other facilities. ADAAG has just been updated, in 2010, but the public rights-of-way section has not yet been published as final.